Independently owned since 1957, we also represent additional manufacturers of in-plant modular offices, ergonomic lift tables, mezzanines, vertical reciprocating conveyors, industrial sectional doors, and fire and automatic doors. Timbers – Kovar Company primarily represents Serco®, an industry leading brand owned by Entrematic. Serco is a world leader in the manufacture and sale of loading dock equipment with an original product line consisting of dock levelers, seals and shelters and vehicle restraint systems. 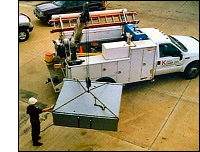 Timbers Kovar Company also represents TKO Industrial Doors along with a full complement of after-market parts for all manufacturers of loading dock equipment. We are also an exclusive representative for RYTEC High Speed Industrial Door and the Overhead Door Ribbon Distributor for Northeastern Ohio. Timbers Kovar employs 23 professionals. Nine Sales Representatives, with an average industry experience of over sixteen years, are dedicated to a consultative approach to fulfilling customers’ needs. Our fully equipped, factory trained service department consists of (8) eight service trucks and (11) qualified eleven technicians. We have the capability to service and install all manufacturers’ brands of loading dock equipment. Planned maintenance programs are also available. Timbers Kovar represents the following brands of industrial equipment, Chase Doors®, Copperloy Products®, Bishamon®, Autoquip®, Portafab®, A Wall®, Horton Automatics®, Overhead Door®, Amarr Doors® and Cubic Designs®. Timbers Kovar Company is a multi-million dollar organization with a long tradition of customer satisfaction in industrial equipment sales and service in Northeast Ohio and Western Pennsylvania.